For people who spend lots of time in this part of their home the best way to save electrical energy is by replacing existing lighting with efficient LED lights for garage. LED home lighting has dropped considerably in price over the last couple years making it affordable for even, yes, the garage. For many years I’ve resisted the energy efficient fad because of my dislike for the Compact Fluorescent bulbs that have been on the market for several years now. These replace the standard incandescent bulbs. The main problem with these is the time it takes for them to gain their full brightness. While there have been some with instant-on, the vast majority of retailers have the slow-start variety. Using one of these bulbs feels like a step back in technology, regardless of the energy saved. LED bulbs overcome the instant-on issue that many Compact Fluorescent bulbs have, but until recently have been cost prohibitive. Along with this, the variety of LED type bulbs beyond the standard bulb has been lacking. All of that is changing though, and fast. Not only are the costs for LED bulbs dropping but the variety of types and their application uses is also increasing. Nowhere is this more evident than in home LED lighting fixtures for your garage. The traditional utility shop light fixture with two four foot long fluorescent bulbs has been in use for a long time in those work areas in your garage. The cool, white light they provide helps to illuminate those dark corners of your garage. LED garage light fixtures are readily available to work in this same environment. Perfect for garages, basements, game rooms, utility rooms, workshops, cabinets, closets and attics, they provide the same cool, white light. I found this brand name LED shop light fixture which is highly rated. The price is reasonable and has a large number of positive reviews. While the LED Utility shop light fixture works well in your garage and other parts of your home it is still a fixed, mounted fixture. Sometimes there is a need for more portable light, for example a corner of your garage or basement needs a bright light so that you can repair a plumbing or electrical issue. 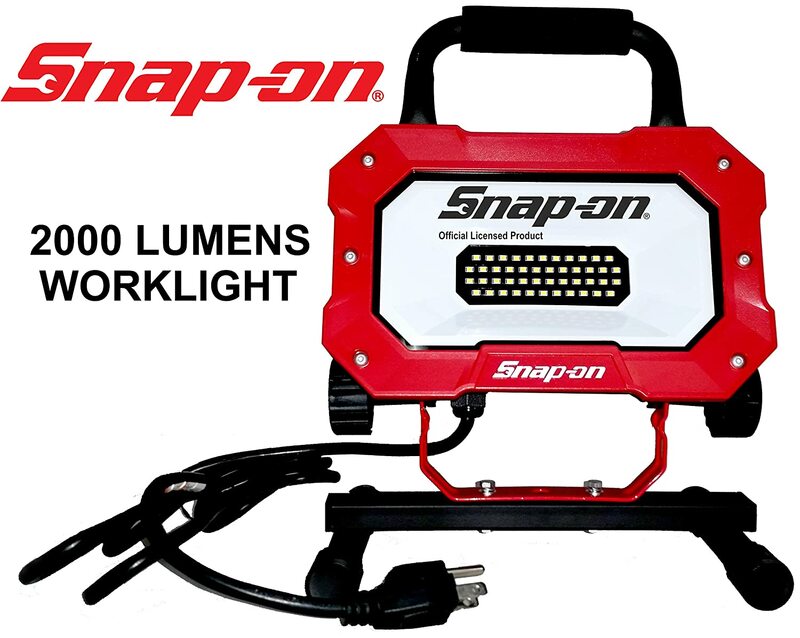 The Snap-on LED Work Light does a great job in lighting up this scenario. It comes with Low power consumption, a sealed on/off switch and can be used for indoor/outdoor dry locations. This is another highly rated LED garage light. The last LED garage light fixture I’m going to high-light is a retractable Cord Reel Shop Work Light. This is another highly rated product. It provides a bright 500 lumens LED light and comes with a 30 foot cord with a grounded outlet in the handle. This light can be mounted on the ceiling of your garage and provide lighting and power anywhere in your garage without having to dig out an extension cord or drop light. Much progress has been made with affordable LED lighting. Many different options now exist for other parts of your home, such as the garage. For the many spouses out there with your other half working on cars or other hobbies in the garage do not hesitate to purchase one of these. They are all great products that will be well received.